If there's one thing about burgers that's always true, it's that, no matter how much cash you've got in your pocket, you're gonna want one. 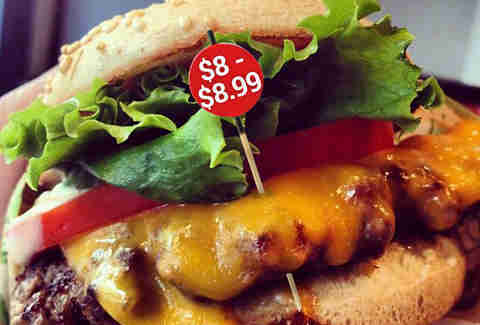 Which explains why Americans eat nearly 50 billion burgers a year. Aka three burgers a week, PER PERSON -- a stat that is both terrifying and inspiring all at the same time. Anyway, the point is: you crave burgers constantly, but you can't eat a $28 burger every day of the week (unless you can, in which case we should totally be best friends). 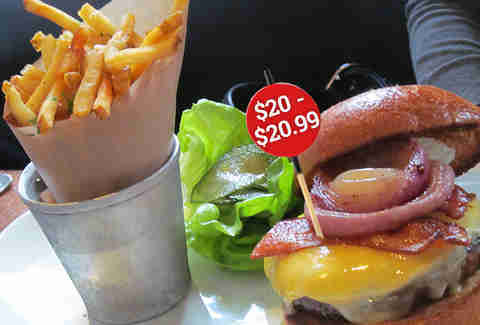 For the rest of you, we broke down the best burgers in San Francisco by price, so whether you just paid rent or just got paid, you'll know where to find a delicious burger that's in your price range. 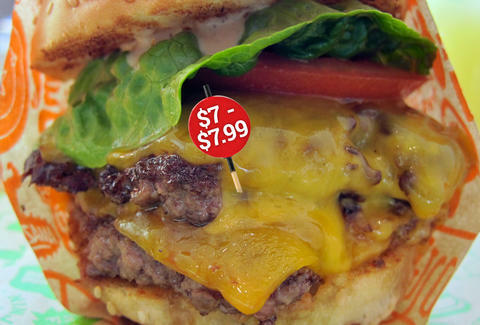 They call it the "Mini", but sometimes a fat, juicy 1/4lb burger is all you need to hit the spot. With cheese, it’ll cost you a fiver and two quarters. The Drive In Cheeseburger is 1/3lb Certified Angus, double American cheese, griddled onions, pickles, lettuce, tomato, and 1000 Island dressing. All on an Acme bun. Hard to believe you get all of that for just six bucks, but you do. The 1/3lb classic cheeseburger comes with American cheese, lettuce, tomatoes, pickles, and secret sauce on a toasted egg bun. 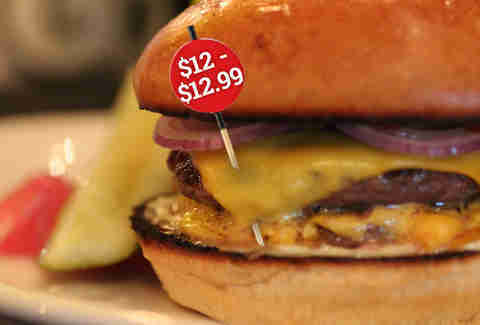 Like all of Gott’s burgers, it’s cooked medium well and served "a little pink inside". It can be all yours for just $7.99. This fast food-style burger is made with Niman Ranch all-natural beef that’s ground fresh every day and griddled in all the previous burgers' grease (YES). 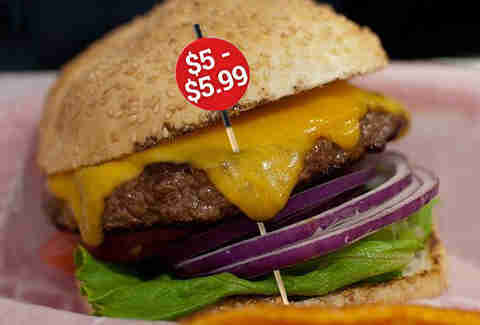 The patties are a little thin, so order the Super Burger (two 8oz patties) and add cheese and bacon. Grand total? $8.75. Yeah, it’s a hamburger shaped like a hot dog, but this burger is so much more than a gimmick. It's made with a house-ground blend of chuck, brisket, and sirloin, and the bun is buttered and toasted. 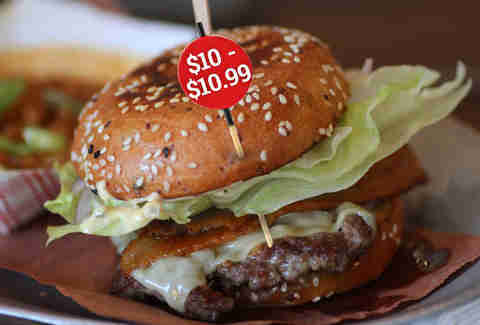 Then it’s topped with everything you love on a burger, including a special house sauce. Price? A cool nine bones. Is it a little presumptuous to name your burger “The Best Damn Cheeseburger”? Sure. Is it less so, though, if... you're right? Order a single (1/4lb grass-fed beef patty with Gruyere and their secret sauce), add bacon, hand them an Alexander Hamilton, and go stuff your face on the patio. This Basic Burger is actually anything but. It’s juicy, has a nice, herby taste, and comes on a roll that’s squishy in the best way possible. Caramelized onions and aioli come on the side, but you know better than to leave them there. And it's kinda still affordable at exactly $11. 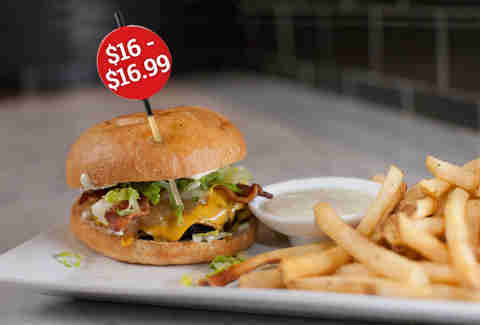 Hello, beef and bacon ground together to live harmoniously in one mouth-watering patty. Served with American cheese, house mayo, ketchup, onion, and pickles on the side, this guy costs an even $12. Tack on five for a beer, and you have everything you need in life for under 20 bucks. Thirteen dollars for a great burger is a bargain in this town, which's somehow even MORE bargain-y at Belcampo Meat Co., where the beef is raised sustainably on their farm and slaughtered and butchered in their facilities. The cheeseburger comes with a dry-aged patty, thick slice of cheese, caramelized onions, butter lettuce, and house sauce on a sesame bun. The Corner Store burger is seared in a cast iron skillet and then dressed with aged cheddar, pickled red onion, bread & butter pickle, garlic aioli, and last, but certainly not least: bacon jam. Bacon. Jam. Eat this deliciousness at lunchtime when it's $14 ‘cause you’ll pay a buck more at dinner. 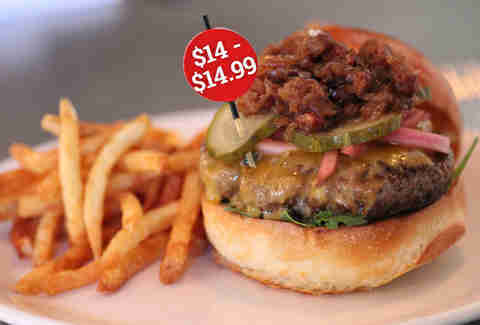 If they could, San Franciscans would totally nominate the Nopa burger for Homecoming King. 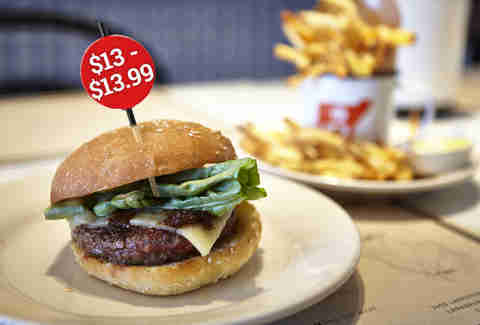 It's that popular, that good, is made with grass-fed beef, and comes on a house-made brioche bun. Still, somehow it's "only" fifteen smackaroos. 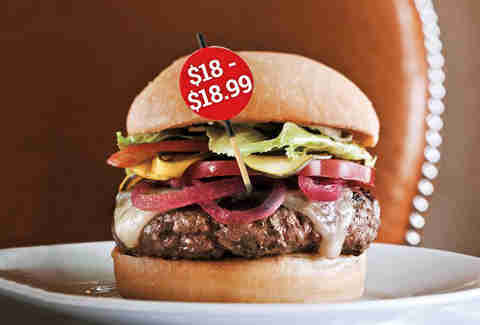 The Marlowe Burger is what originally put Marlowe on the burger map. Best of all? It comes with all of the good stuff (caramelized onions, cheddar, and bacon) ALREADY ON IT. No need to add any extras. 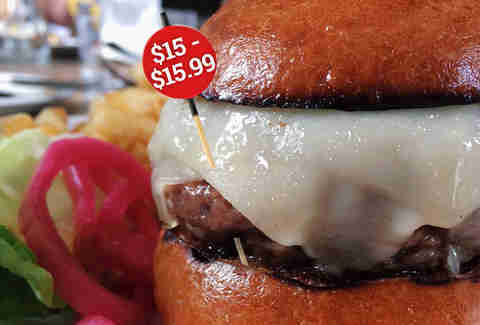 Find it at the new Marlowe and Park Tavern for a totally deserving $16. 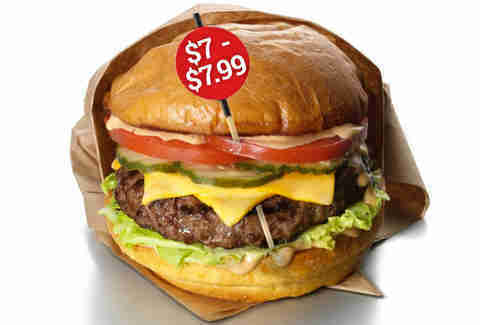 For seventeen bucks, a burger better be really freaking gourmet, and Lark Creek Steak's Mushroom Steakburger is just that. The beef is a blend of house-ground rib eye, New York steak, and filet mignon. Yup, filet mignon. In your burger, yo. 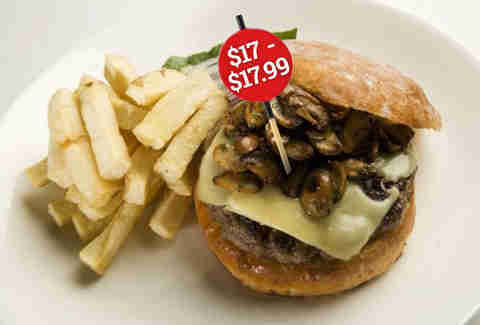 It’s served with Swiss cheese and roasted button mushrooms and will set you back $17.75. We love the Spruce burger for many reasons, one of which is that you can only get it in the bar, and another of which is they use an English muffin as a bun and it actually totally works. Also, it’s just a really good burger. 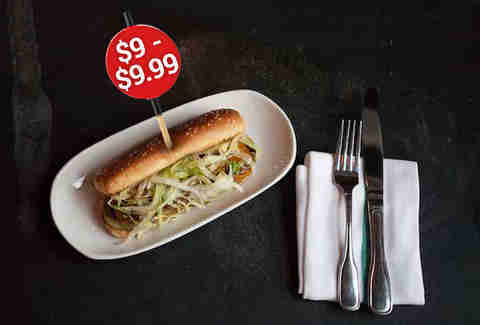 And yeah, it’s 18 dollars, but that’s a bargain compared to the $38 steak. 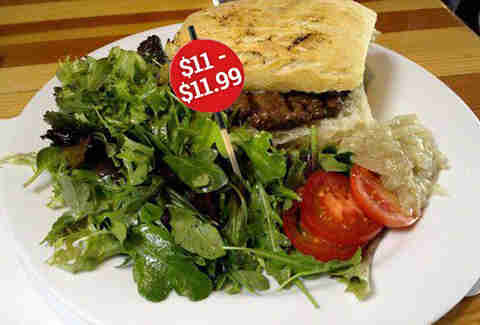 The Zuni Burger was SF’s first "fancy" burger, but it hasn’t changed in 20 years and that’s a good thing. The hand-ground patty comes on grilled house-made focaccia (which is always controversial, but just go with it) that’s smeared with aioli. You can only get it at lunch and after 10pm, so plan wisely. Cost: 19 clams. 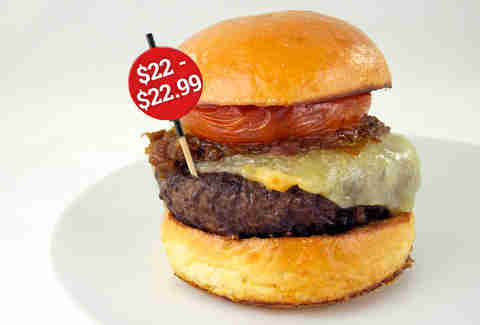 Is twenty dollars a lot for a burger? Not when it’s “Le Grande”. 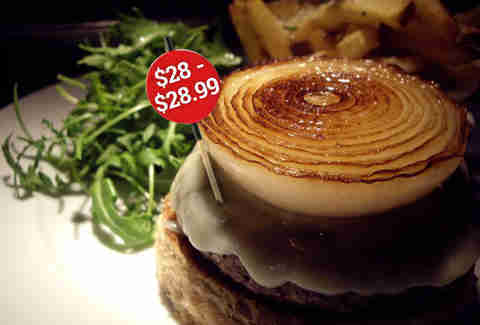 Seriously, this burger is the real deal and for 20 bucks you don’t just get a burger, you get a grass-fed burger with Brie, roasted onion. and smoked bacon on brioche. It’s smoky, it’s sweet, it’s salty... just order it already. This $22 Michael Mina burger is a thing of beauty, but be warned: after you eat it once, you’ll want to eat it all of the time, and that could get pretty pricey pretty quickly. Only available during lunch or at the bar, the Bourbon Steak burger comes with Nicasio Valley Reserve cheese and caramelized onions. 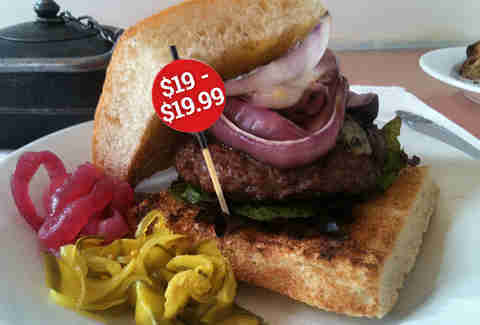 But it’s the hearty beef texture and flavor that makes it worth every penny. All 2,200 of them. It’s a cheeseburger with black truffle. That should be all we need to say, but we’ll also let you know that it’s served open-faced on rye and is unlike any hamburger you’ve ever eaten. 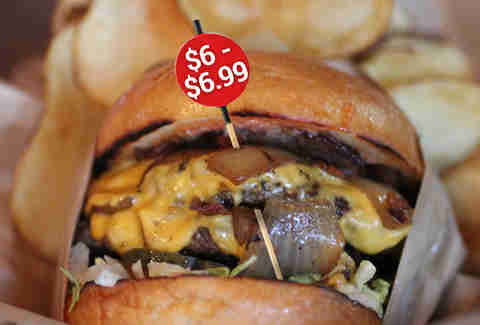 If you can, get someone else to pay the bill since this over-the-top mouth-pleaser is listed at 28 dollars. Daisy Barringer is Thrillist's SF Editor and she just really gets where the Hamburglar is coming from. Also Cookie Monster, but that's another bio for another story. Probably one about cookies and not hamburgers. Follow her on Twitter @daisy.